What is TOMNET, and what do we do? 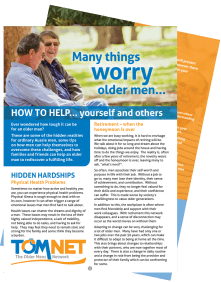 TOMNET provides older men with opportunities for mateship, the chance to re-connect with the community, and cope positively with life after loss. TOMNET is a non-religious and non-party political organisation, and all men are considered equal. Our aim is to reach out to older men who are lonely, isolated, and in need of friendship. 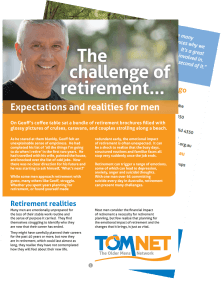 Men over 50 years of age are welcome to get involved with TOMNET. There are many opportunities outlined on this page for building friendships and getting involved. Contact us for more information. Radio COTA Podcast # 98 looks into the forgotten generation that is older men. We speak with Louise Adcock, the Manager of The Older Mens Network, (known as TOMNET), which creates networks of older men (50+) who genuinely care about the welfare of each other and find a sense of belonging. 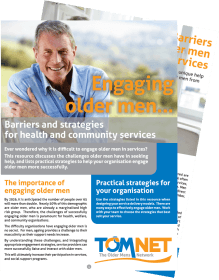 Ever wondered why it is difficult to engage older men in services? Use the strategies listed in this resource when designing your service delivery models. Many men are emotionally unprepared for the loss of their stable work routine and the sense of purpose it carried. Learn how to plan for a successful retirement. Ever wondered how tough it can be for an older man? Find out what questions you should ask yourself. Learn how to help…yourself, and others. Monday to Thursday | 8.30 a.m. to 4.00 p.m. Please use the contact form below to send your enquiry. We will contact you as soon as possible, alternatively, please call the TOMNET Centre on 07 4638 9080. Keep up with what’s happening in your organisation. Featuring stories from bus trips, Volunteering, barbecues, helpful articles on mens issues, a few jokes here and there, plus events and special interest group updates. Please contact us for previous versions of the Newsletter. If you would like to receive the TOMNET Newsletter via email, please use the Contact Form to send us your email address and you will be added to our mailing list. 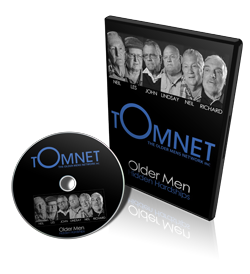 The TOMNET DVD features the lives of six older blokes sharing their stories of hardship and personal struggles in an effort to highlight older mens issues. Sales of the TOMNET DVD help raise valuable funds for Members while spreading the message of older mens issues within the wider community. TOMNET Members are involved in a range of activities which promote mateship, wellbeing and support. Our Members invite you to come along and meet a few of us, we all have something in common. At the TOMNET centre (223 Hume St) on Tuesdays, retired farmers get together and have morning tea with each other. Many farmers retire to Toowoomba and lose their connections with the bush, and each other. We are trying to reconnect these men to help them regain their sense of purpose in retirement. Come in and have a coffee, meet a new mate, or connect with an old one. From 10 a.m. until noon. every Tuesday except for Public Holidays. Member driven – every week is different. Guest Speakers, Life Stories, Trivia Days, Singing, Barbecues and much more. Come in and meet some of the guys. At the TOMNET centre (223 Hume St) on Thursdays, 20-30 blokes get together and shoot the breeze. Come in and have a coffee, meet a new mate or organise a get together. From 9 a.m. until 11.30 a.m. every Thursday except for Public Holidays. TOMNET has a wide range of interest groups the men are currently involved with. Details can be found in our Newsletter or calling the TOMNET Centre. TOMNET Volunteers visit several Aged Care facilities located around Toowoomba to talk to other older men who may be isolated because of health, transport, or any other reason. Currently we visit Lourdes Aged Care, Yukana Retirement Village, BUPA Rangeville Aged Care, Nubeena Rest Home, Westhaven Retirement Village, Brodribb Home, Salem Lutheran Nursing Home and Symes Thorpe. The map below shows the groups actively supporting older men within their communities. Contact details are listed below, or call the TOMNET Centre (Toowoomba) on 07 4638 9080. Help spread the TOMNET message. We can help you setup your own older mens network. Call the TOMNET Centre for our step-by-step guide - we will help. Our expertise is Older Men. The Older Men's Network was originally formed by eight older men who identified high levels of suicide in their peers within the Toowoomba community. They set to reduce this. The group was driven by older men, for older men - this fundamental principle is the reason for TOMNET's continued success today. The Management Committee meet every 3rd Monday of the month at 9.30 a.m., except December.